I know a lot of people don't like textured polishes - and I'll be the first to admit that some of them are just not for me. 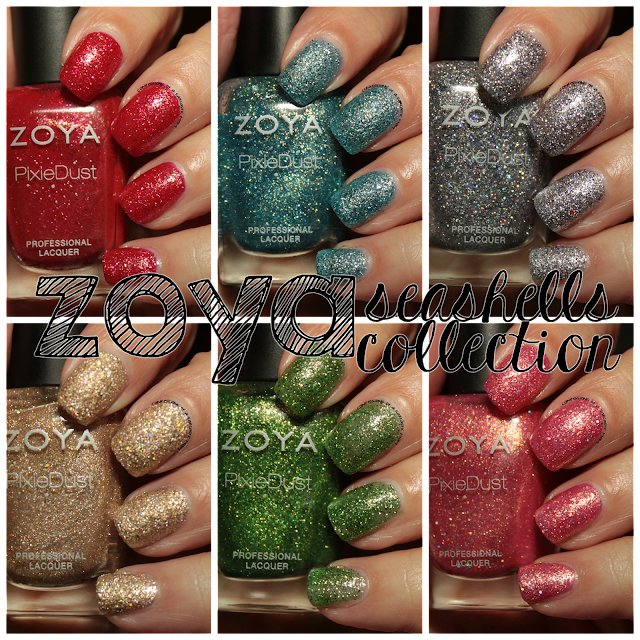 However, I have never been let down by any of the Zoya Pixie Dusts. The newest collection, for summer 2016, is the Seashells Collection! Linds is a cherry red Pixie Dust that is more candy-like than the previous reds. It's got some bright pink glitter in it to add depth. I used 2 thin coats for what's pictured. Bay is a very sky-like blue Pixie Dust that is just gorgeous! There's gold and silver glitter thrown in to the mix, and it just shines! Again, all I needed was 2 thin coats. Tilly is a shiny silver-grey with holographic glitter. The glitter is darker, and it flashes a navy blue when you roll your fingers in the light! I think it's actually just a darker grey, but it sure it pretty :) I used 2 thin coats. Levi is a sandy gold Pixie Dust that really, honestly looks like gold on the nail! It's just super shiny and pretty. When I had this on, I couldn't quit staring at my nails. This one was very pigmented, and 2 thin coats were needed. Zooey is a bubblegum pink Pixie Dust, and it super shiny. There's gold and holo glitter stuffed in there, and it's very pigmented. I used 2 thin coats for what's pictured.